That Holiday tattoo you’ve been hiding? That has got to go! Tattoos are now no longer for life as you can now make them vanish with our Q-Switch laser! A change in your life, image or personality can cause a tattoo to become embarrassing and unwanted. Here at Aesthetics of Essex, we have seen a growing amount of people wanting to remove their tattoo disasters, as we specialise in removing tattoos of all sizes and colours. It has been said that “A tattoo is a memory that can never be forgotten” –or is it? Often our reasons behind getting inked are the reasons behind having them removed too. Although the tattoo may have once represented deep sentimental value, tattoo removal is becoming increasingly popular. Whatever your reasons may be for wanting it removed, maybe it’s because of maturity, a break-up, a change in interests or even a drunken mistake, we have seen it all! Our therapists are specially trained and experienced in tattoo removal to provide you with the best results possible. We use the Q-switch laser, which offers high efficiency at a very low risk. 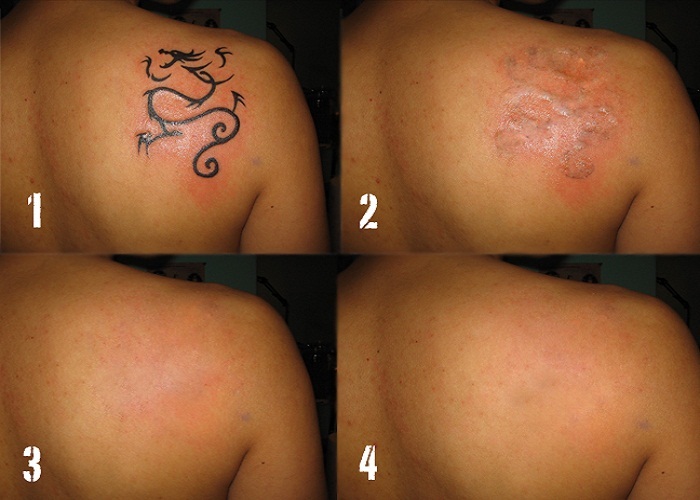 It enables effective tattoo removal with little chance of side effects or leaving scars. The heat produced from the Q-Switch laser will penetrate through the top layer of the skin and shatter the tattoo ink into pigment particles. Your body’s immune system will then gradually absorb the fragmented pigments of your tattoo and while pain tolerance is an individual matter, most people tolerate tattoo treatment well; the sensation is described as a rubber band snap to the skin. Topical anaesthetic can be applied on sensitive areas as well. Here at Aesthetics of Essex, our focus is to provide exceptional services to clients that will leave them feeling more confidence and comfortable in their own skin. We therefore recommend this service for safe and effective tattoo removal. We guarantee that you will be very pleased with the long-lasting results that we will help you achieve! So if you have a tattoo and would like it removed, get in contact with us to arrange a FREE consultation and patch test.